Kremlin spokesman Dmitry Peskov said on Friday Moscow had not yet received a message from Venezuelan opposition leader Juan Guaido, who said he had sent a communication to Russia. “We have not received any messages yet. If or when we receive it, we will review it,” Peskov told reporters. 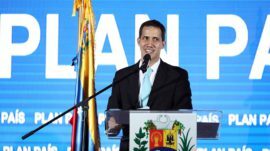 He said Russia did not recognize Guaido as Venezuelan president and denied any Russia’s involvement in the sale of Venezuelan gold.